Walsall and Errea have come to terms on a three-year agreement, which brings an end to the Saddlers' troubled deal with JD Sports. Following plenty of social media speculation Walsall Football Club have finally revealed their home and away kits for the upcoming 2017/18 EFL campaign. You can see images of the shirts by scrolling down the page. Manufactured by Errea and sponsored by HomeServe, the kits will be on sale online now and via 'The Club Shop' at Banks's Stadium from Thursday morning. 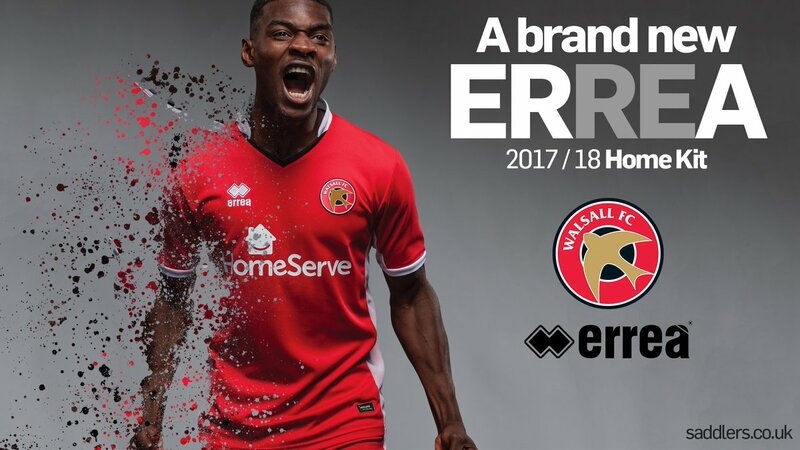 News, released via Saddlers.co.uk confirms; The club announced a new three-year deal with Italian sportswear giants Errea last week and our new home and away kits are on sale NOW from our Online Store, and will be on sale in the Club Shop, which is closed for the rest of today, at the Banks’s Stadium from tomorrow morning (Thursday, June 8) from 9am. And the Club Shop will also be opening on Saturday between 10am and 2pm for fans to purchase their 2017/18 replica kits. Replica training wear will also be on sale alongside the kits - modelled here by Saddlers stars Joe Edwards, Florent Cuvelier and Amadou Bakayoko - in the Club Shop and from our Online Store. The new shirts from Errea - the club’s Technical Kit Supplier - mix two types of fabric. The main fabric is a microfibre of polyester with a soft feel inside which helps to wick away sweat as well as giving a higher level of comfort. The exterior has micro-perforations which allow moisture to exit and air to enter, while the side panels are made from a breathable mesh which helps with body temperature management. 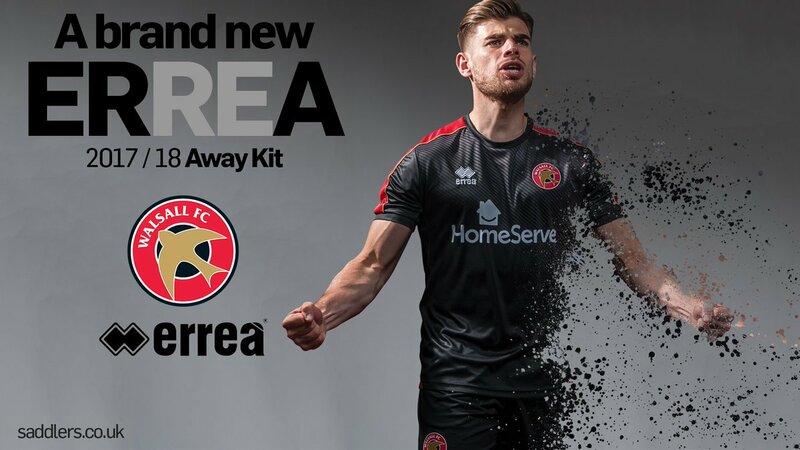 The new designs, created as a collaboration between the club and Errea, draw influence both from The Saddlers’ history and from the first time Errea supplied the club in the 90s. The new shirts will also feature the HomeServe logo after the club confirmed a new five-year principal partnership with the Walsall-based home assistance provider last month. Adult shirts retail from £39.99 to £44.99, shorts for £14.99 and socks (7-11) at £8.99. Junior shirts will be available from £27.99, shorts £10.99 and socks (12-2 and 2-6) for £6.99. The club will be selling home and away kits, plus our brand new goalkeepers kits and training wear. No baby, infant or ladies away kits are currently available.